We were up at 9:00am, grabbed Jake, and piled ourselves into the car by quarter past. 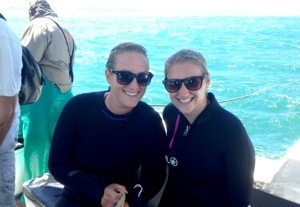 Today, the three of us were going to cage dive with great white sharks! I had been so excited about riding an ostrich that the excitement of swimming with sharks hadn’t hit me until the night before. How cool is this?! 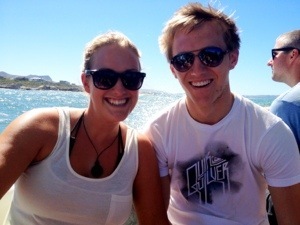 It was a 40 minute drive before we pulled up to the Ecoadventure Shark Diving office in Gansbaai. They served us breakfast, gave us a quick overview of the rules and regulations, then we were herded out to the boat. There were about 20 of us on the tour, which meant a tight squeeze on the lower deck of the ship. Nonetheless, we crammed ourselves on the little benches and sailed out into the ocean. Our dive point was only about 10 minutes away. The water there was only 12 meters or so deep, so shark spotting was much more likely. When we had anchored, we climbed up to the top deck for a final rundown of the rules. Before he had finished, the first shark appeared on the starboard side. “Look!” Someone shouted. And we all piled over to one side of the boat to see. It was a decent sized shark, probably a couple meters long, just barely coming to the surface as it swam around our boat. So exciting! “Okay, for anyone wanting to jump in the cage, get downstairs and put on your wet suit!” Kelsi, Jake and I ran downstairs and were in the first group of 5 to get in the cage. The cage was fairly small, only a couple feet wide and long enough for five people to fit in shoulder to shoulder. We all floated in the cage, goggles on, waiting for our queue. Finally, the skipper would yell “Down! Down! Down!” We’d all take a deep breath, pull ourselves down under the water and watch for the shark. If we didn’t see the shark within 5 seconds, we would just come back up for air and wait for the next one to swim by. We were so lucky. It was never longer than 30 seconds or so before the skipper would call out. We grabbed the bar in the cage to hold ourselves under water. The water was murky, but still clear enough to see a couple meters away. And there, swimming in front of us was a great white shark! The captain calls them white sharks. “There’s no difference between a white shark and a great white shark” he said “we just call them white sharks to desensationalize them to the world.” Fair enough. 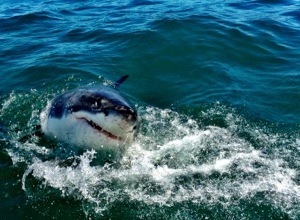 Personally, I’m going to refer to them as great white sharks, because to me, they were epic! The first few times the shark swam by it just snapped at the bait and then sped away. But eventually it came closer and stayed longer, sometimes swimming right under our feet, or all the way across the front of the cage. Occasionally, it would splash up above the water right in front of us. Kelsi and I were giddy with excitement (obviously). We were having more fun shark spotting than the rest of the group combined! During our second dive, a larger shark started lurking around the boat. It was huge, at 3.5 meters long. Everything I expected from a great white shark was what we saw. Jagged sharp teeth, fierce beady eyes, scars on its fins and sides from fights past: it was more amazing by far than I ever imagined! The big shark hung around for a while, lunging for the bait that we threw out on a line from the boat. We hadn’t seen it for a minute or so when the skipper finally yelled out. We all sunk down into the cage. 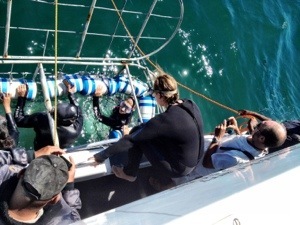 We could see the shark about 2 meters away come splashing down into the water from above. It had just barely missed the bait again. Then it turned and swam towards the cage, right at Kels and I. If we hadn’t already been holding our breaths, I’m sure this is where we would have started. 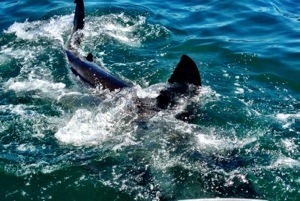 The shark flew at us with incredible speed, then turned abruptly to the right and it’s side came crashing into the cage. It knocked the cage back against the boat and jostled the five of us inside. Then it swam, a little slower this time, right along side the cage. Its fins were coming into the cage and brushed up along Kelsi’s hands. It swam, still pressed up against us, then finally down into the dark water below. Kelsi, Jake and I spent the majority of our tour down in the cage. Some of our group didn’t even get in the cage, and others only wanted to go once. Fine with me! All in all we saw five sharks, at least two of them female. The smallest was around 2 meters and the largest 3.5. We were very lucky. The captain said sometimes groups wait around for an hour and a half before the first shark spotting. We had a constant stream of sharks from the moment we arrived, until we ran out of bait a few hours later and had to come home. It was incredible! When all was over, we headed back to the base for lunch and then left for home on an adrenaline high! What an exciting morning! 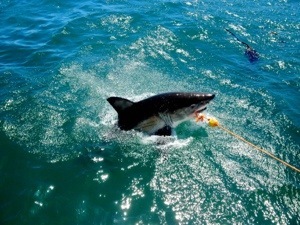 This entry was posted in Africa, South Africa and tagged cage diving, Gansbaai, great white sharks, Shark diving by hilarylust. Bookmark the permalink. It was $108 Canadian. That included breakfast and lunch, the whole three and a half hour dive and also our room at the hostel the night before! So not bad!